The Emerald Coast is just a few "giant steps" away. Consider every possible weather scenario covered, with both outdoor Gulf-front and indoor pools. Assign a rotating breakfast, lunch and dinner crew so you get a few meals off. As nice as the rest is, the balcony may be the highlight of the whole place. 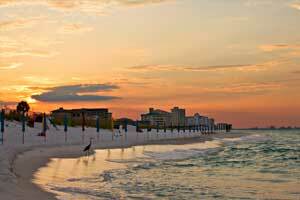 You're just a few yards from the powder-white sands of the Emerald Coast. The resort is next to a shopping mall and go kart track. SunDestin Beach Resort sits just yards away from the powder-white sands of the Emerald Coast, which makes getting to the beach a simple proposition, even with little ones in tow – and all their gear. You can design an elaborate sand castle, hop in for a quick dip, or swim out to the floating playgrounds off shore. As you stroll back to the resort’s Gulf-front pool, stop to admire the view from the sundeck. Go for a swim or relax poolside with the latest issue of People magazine while the little ones play at the children’s splash pad. There’s also an indoor pool, perfect for rainy days and the chillier winter months. Sink into pure relaxation at the sauna or sneak in a workout at the fitness center while the kids hang out at the arcade. Grab a quick bite at the on-site bar & grill, or plan your own family cookout on the BBQ grills. Individually decorated one- to two-bedroom condos sleep four to six guests. Full kitchens have everything that you need to whip up anything from snacks and sandwiches to multi-course meals. Bring the kids along to Winn Dixie Grocery Store to make sure that no one’s favorites are forgotten. When you return from the store, recruit the kids to help bake your famous sugar cookies (and bring cookie cutters from home so they can make them into fun shapes). Enjoy the cookies during family movie night, thanks to your Flatscreen TV with cable and DVD player. Bring favorite movies from home or browse the selection of DVDs available to rent at the resort and call everyone into the living room. First kid on the couch picks the movie. Upgrade to a deluxe one-bedroom condo for an in-suite washer/dryer. SunDestin Beach Resort by Wyndham Vacation Rentals is located on its own beach. Let the kids practice their sandcastle-building skills while you work on your sun kissed look. Local restaurants, shops, a go-kart track, and Henderson Beach State Park are all within easy walking distance of the resort. Gather the shopaholics in your crew and head to Destin Commons Mall for a fun day of shopping. The little ones will love Build-a-Bear. Let them choose a stuffed animal and make it themselves. Need a new pair of shoes? Foot Locker and Kid’s Foot Locker have something for everyone. Treat yourself to some new jewelry at Pandora or pick up a bath bomb at LUSH to enjoy back at the resort. Catch a flick at the AMC Movie Theater. When the kids get hungry, there’s Panera Bread, Smashburger and Redbrick Pizza. Grab a frappuccino at Starbucks and treat the kids to frozen yogurt at Cups and Cones. Up for a day of underwater fun? Big Kahuna's Water & Adventure Park features over forty attractions and rides. There’s even an entire water play area just for the little ones! Beach chair and umbrella services are available at an additional charge (March through October). If guests want to bring their own umbrellas, they must be of commercial grade and be inspected by SunDestin Resort personnel. For more information, please contact the office using the information on the reservation confirmation received after booking.